I was approached by Packt Publishing representative, asking if I would be willing to make a review of this book. This was interesting because at that moment I was reading pfSense 2.0 Cookbook from the same publishing company. I was generously provided with the book, and here we are a month later. 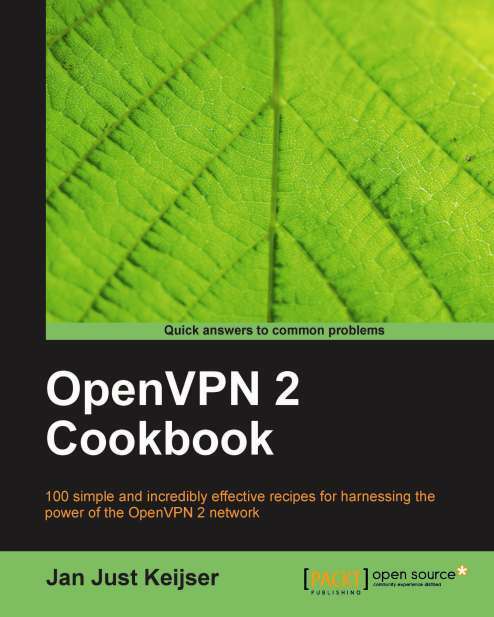 The OpenVPN 2 Cookbook main subject is the use of OpenVPN in different scenarios. Its aim is to help you along the way of implementing an OpenVPN solution. For more detail description take a look at the detailed description Here. My experience with OpenVPN is based on three years of different deployments. You can find more details at the bottom of this post. The book is an in depth examination of OpenVPN and how to use is in your every work. If you are in a hurry you can find a quick fix in the huge amount of recipes, or read it from cover to cover and get extensive knowledge of OpenVPN, its capabilities and different usage scenarios. The book states that prior knowledge and experience of system administration, TCP/IP is required, also in OpenVPN installation. The examples in the book are made mostly on Linux based systems, so prior knowledge in the field is required too. If you are fresh to field, probably first step is to take a look at Beginning OpenVPN 2.0.9 and then continue with this book. As the cover states: Quick answers to common problems. The book is structured in twelve chapters, and each chapter consists of about eight to ten sub topics that are called recipes. These recipes are like short How Tos for a particular case. The valuable thing is that throughout the chapter the recipes build on each other, starting from very basic configuration to more advanced ones. To get an impression you can take a look at the Table of Contents. Every recipe has a How it works sections. They are extremely useful to understand what and how is happening behind the scenes. And that’s not all, after this section additional value is provided in the There’s more sections, where additional explanations and further developments are delivered. Does it achieve its promises? The first topic that really gets me going was 3-way routing in the first chapter. I was planning to implement this for small number of fixed endpoints which are less than four. For more you have to read further in the book. The next this that surprise me pleasantly was the PKI, Certificates and OpenSSL chapter. It helped me better understand OpenSSL and give me better idea how to manage certificates. This topic continues in the next chapters about Two-factor Authentication. I was very surprised to see that even hardware tokens can be used to authenticate users. In The Scripting and Plugins, there is a very important secret about scripts execution, which was not known to me, and definitely will help me in future. Logically after you have fixed all the problems a Performance Tuning is your next step. The following two chapters are related to OS integrations and advanced configuration. They help me better understand how to better integrate OpenVPN with the unique environment of the client. The last chapter is all about the new features in 2.2 version of OpenVPN. It is quite useful to have a well arranged section with new features that you might have not known existed up until now. I really like reading this book, and the systematic knowledge that it provides. Whether you are a full time System Administrator or just a part time occupied with the IT in your company, or just wants to establish a secure connection to your home this book will definitely give you the needed advices how to get there. My experience with OpenVPN is based on three years’ of deployments. My first deployment was on OpenWRT where I had to use predominantly command line to configure it and Secure copy (SCP) for certificate transfer, then on DD-WRT where most of the work is done through the Web GUI, with exemption for more advanced configuration that have to be placed in start-up scripts. After that on I used Windows based systems as clients and servers, and lately as you can see from my blog I’m working with pfSense. In the last post we’ve setup a Site To Site with Shared Key, now instead we will use internal Certificate Authority. Honestly speaking if I did not follow this guide, there was no routing between the two sites. pfsense01 will be out OpenVPN server, and pfsense02 will be our OpenVPN client. Client and Server are just host on the two LANs behind routers. 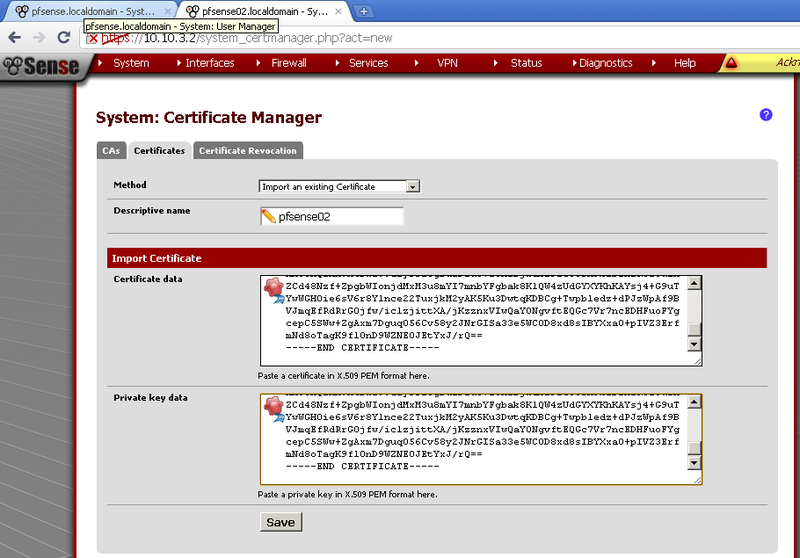 On pfsense01 go to System > Cert Manager, On CAs leaf create new Certificate Authority. Enter Descriptive Name, choose as a method Create an internal Certificate Authority, leave Key length and Lifetime to defaults. Fill in the rest of the fields. 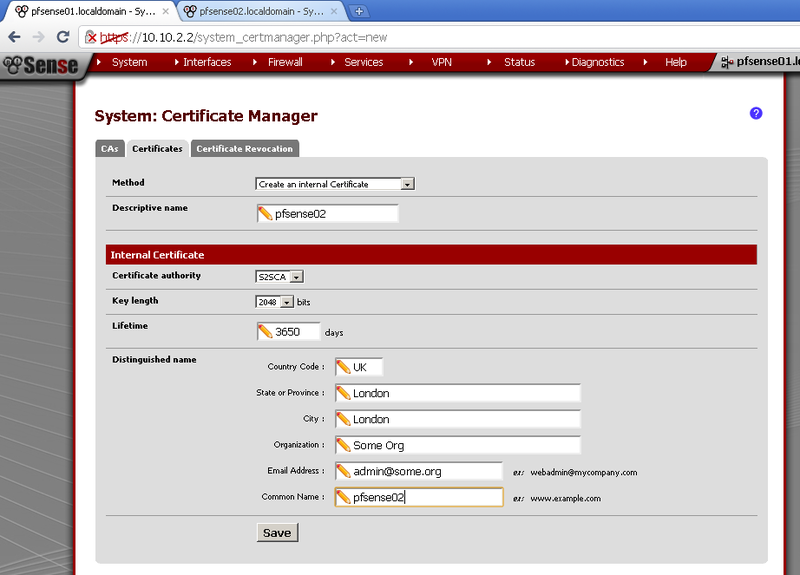 Then go to Certificates leaf, add new and create the server certificate. 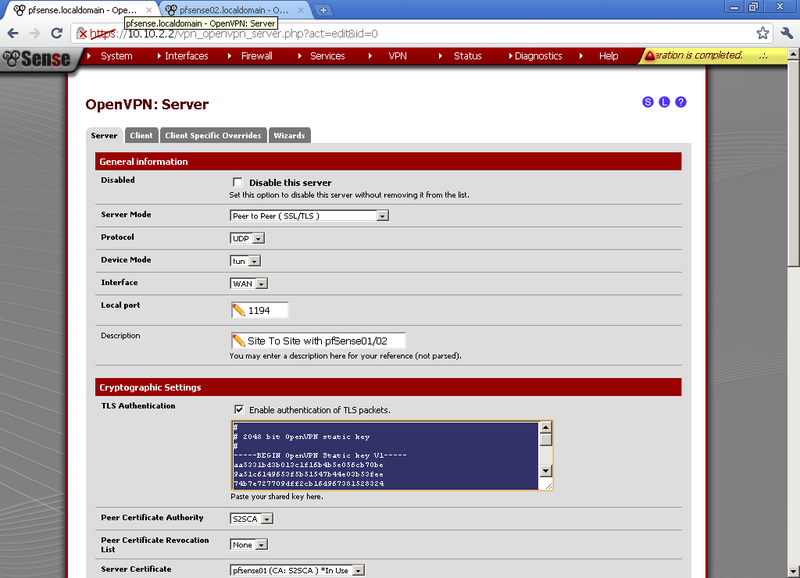 Enter descriptive name, I’ve used the router host name, as a method choose Create an internal Certificate. 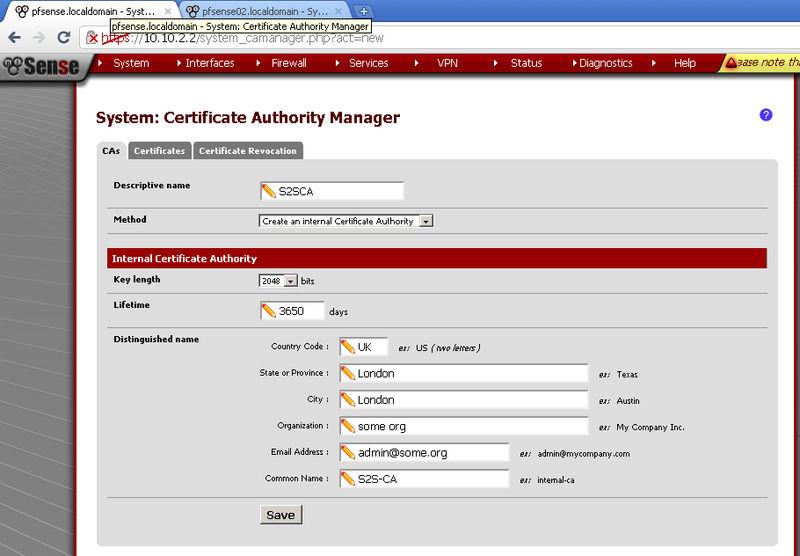 Verify that for Certificate authority the CA that we have created in the previous step is selected. Leave the rest of the fields to default, with exception of Common Name, here enter the host name of the server, in my case it was pfsense01. 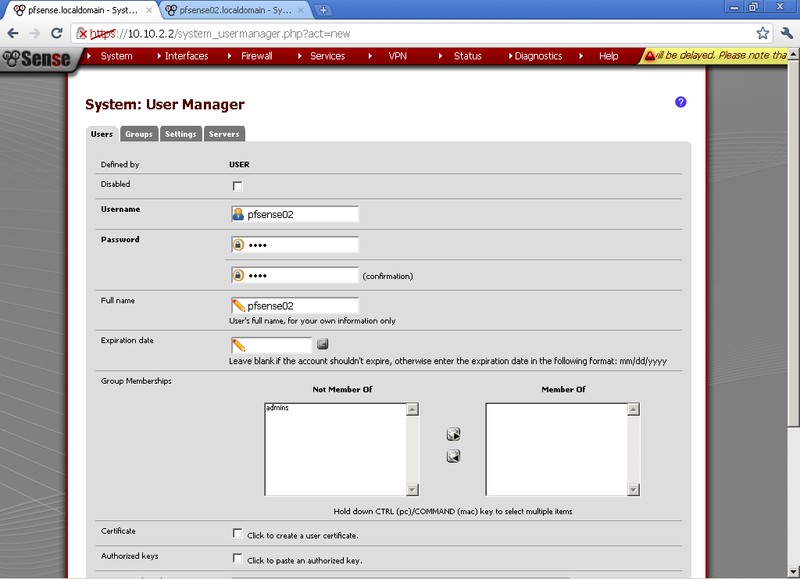 Now go to System > User manager, create new user. For the sake of simplicity for username I’ve used the host name of the second router, pfsense02. Enter Password, for Full name I’ve used again the router name. Then tick the Click to create a user certificate. For descriptive name use the host name of the router, this is the Common Name of the certificate and it is important to match. Instead of creating new user, you can create new Certificate directly. 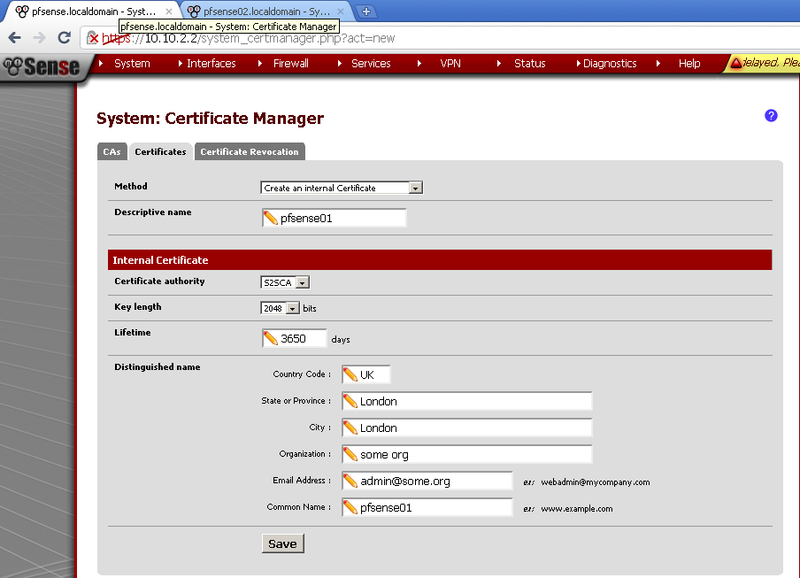 Go to Cert Manager, on the Certificate leaf add new. Again as Descriptive name and Common Name use the host name of the second router, in my case pfsense02. Go to VPN > OpenVPN on the Server leaf, add new. As Server Mode select Peer to Peer (SSL/TLS). As protocol UDP, Device Mode is TUN, Interface is WAN, leave the port to default 1194. 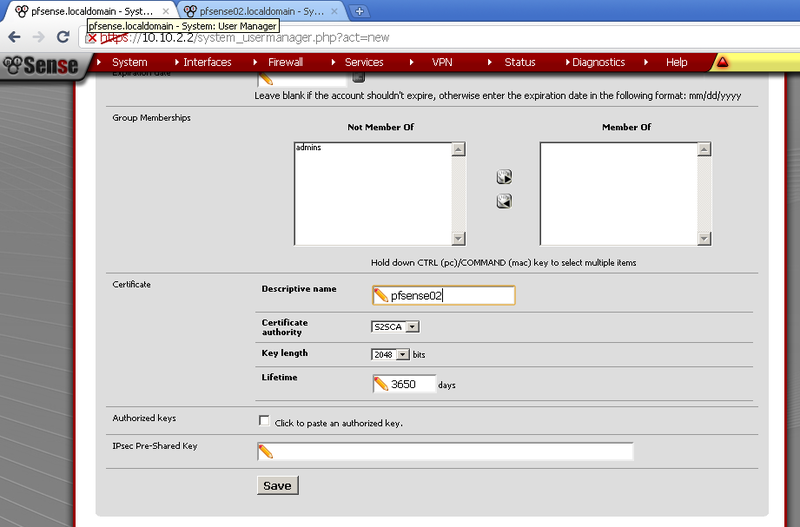 Enter Description, Tick Enable authentication of TLS packets and Automatic generation a shared TLS authentication key. As Peer Certificate Authority select the CA that we have created in the beginning. I did not have a Peer Certification Revocation List so leave it to None. Select the Server Certificate that we have created. For DH Parameters Length you can leave it to the default 1024 bits. Choose Encryption algorithm in my case BF-CBC (128-bit), take note of the algorithm we have to use the same on the client too. As Tunnel Network choose one different from your LANs, in my case the default 10.0.8.0/24. Enter the Local Network, in my case 10.10.9.0/24. Enter the Remote Network in my case 10.10.10.0/24. Leave the rest to defaults. Go to VPN > OpenVPN in Client Specific Overrides, and add new entry for the client. For Common name enter the host name of the second router that we have used as common name in the certificate, in my case pfsense02. Enter some description, and the Tunnel Network, in my case 10.0.8.0/24. Leave the rest to default. Without this step there will be no routing between the two LANs. 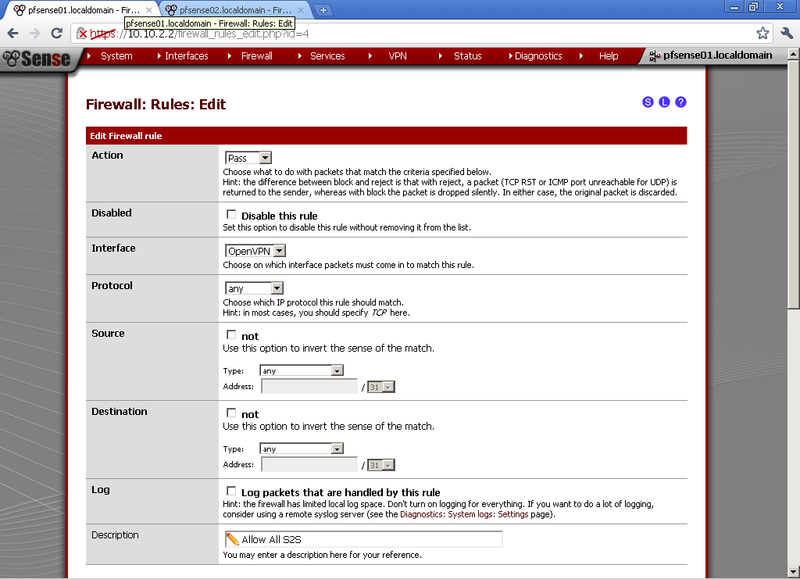 Got to Firewall >Rules and on the OpenVPN leaf, add new rule. Here for testing purposes I’ve made allow all rule. Select any as Protocol, leave the rest to default and enter description. For the client to be able to connect, let’s open the OpenVPN Server port. In Firewall > Rules on the WAN leaf, add new rule. Select UDP as Protocol. 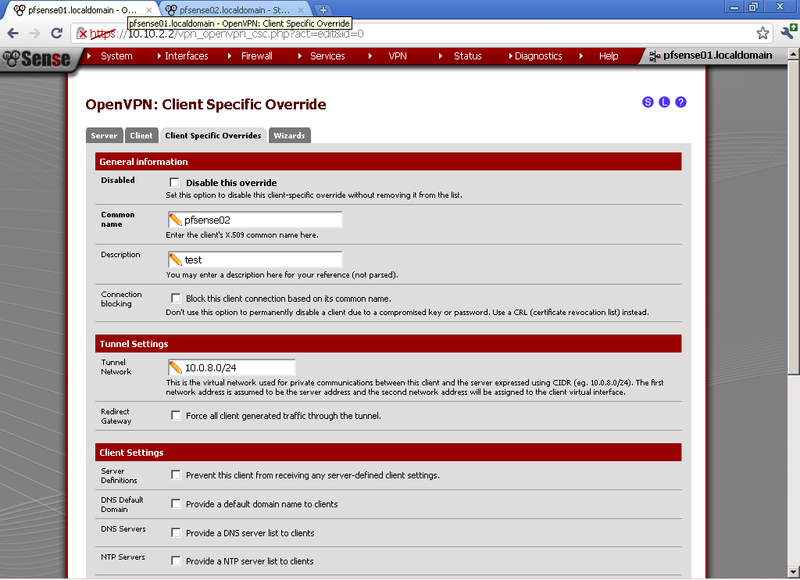 As Destination port Range in our case select OpenVPN. Now it is time to export certificate for use on the second router. Go back to System > Cert manager export public and private CA certs, click on the first downward pointing triangle. As a guide, when you hoover over it the text label is Export CA. 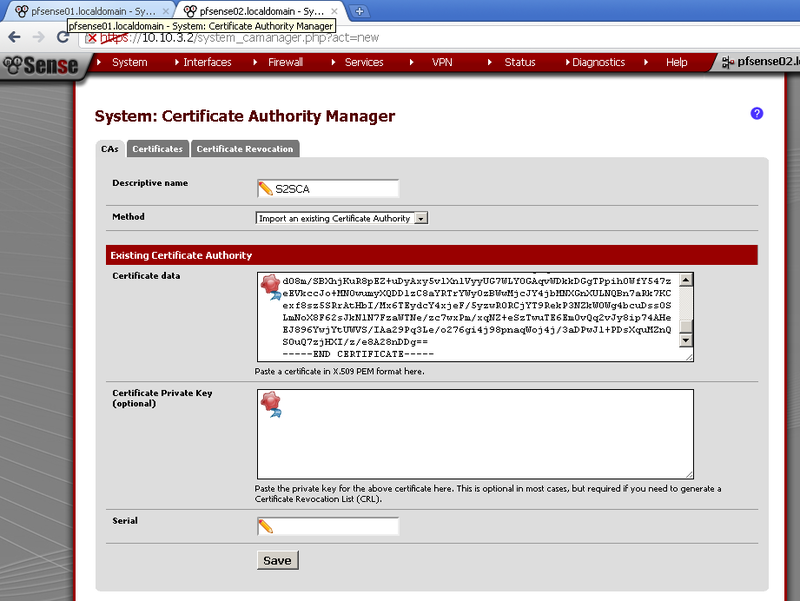 Then go to User Manager, enter the configuration of our user pfsense02, in the User Certificates section click on both downward pointing triangles to download both cert and key. 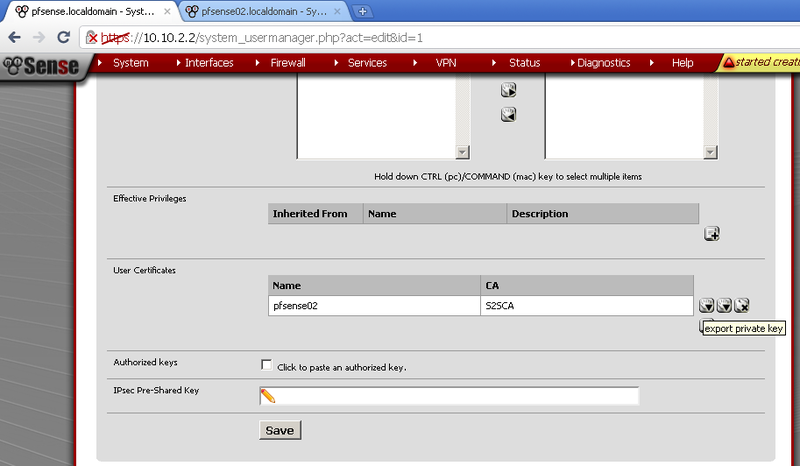 Now on pfSense02, go to System > Cert Manager on CAs leaf, add new one. And as Method select Import an existing Certificate Authority. Enter as Descriptive name the name of the certificate from the first server, in my case pfsense01. You have to have opened the certificate with notepad, or another text editor. Then simply copy / paste the content of the file. Now on the Certificate leaf do the same but paste and the content of the *.key in Private key data. Again enter Descriptive name as the one from the first router. As Server Mode select Peer to Peer (SSL/TLS), Protocol is UDP, Device mode is TUN, and Interface is WAN. 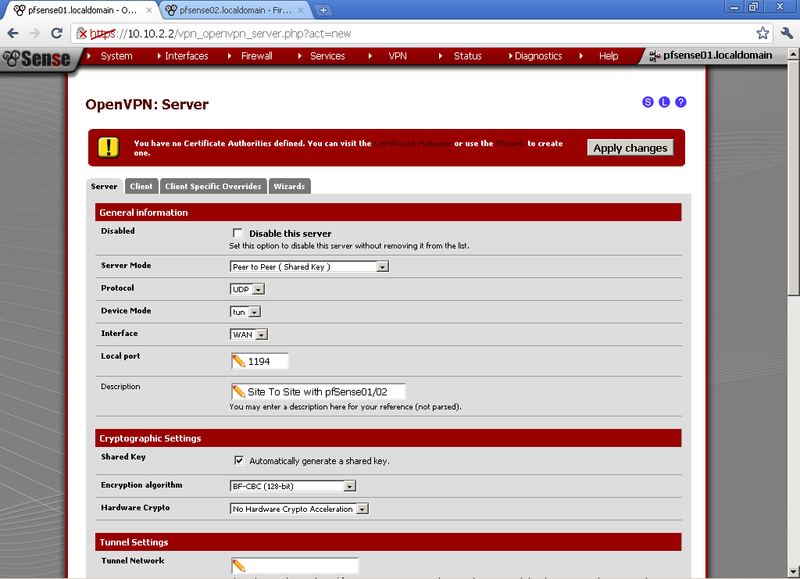 For Server host or address enter the WAN IP of pfsense01, in my case 10.10.2.2 and enter the port. Put some Description. 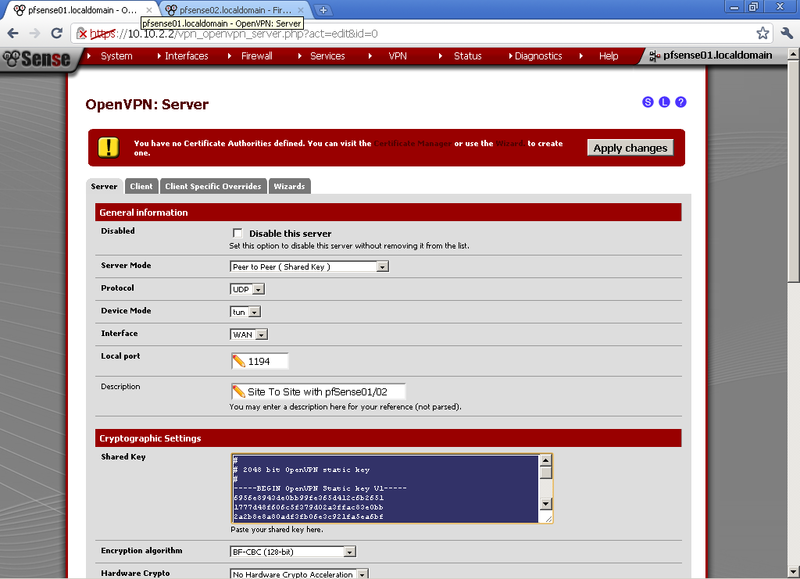 Open the Server configuration (VPN > OpenVPN > Server leaf) on pfsense01, copy the TLS Authentication. 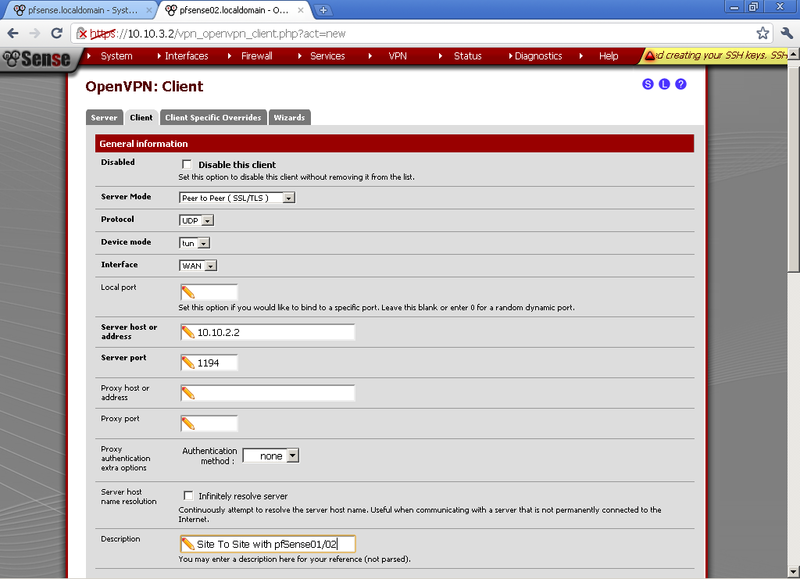 Paste it in the TLS Authentication form on our client configuration on pfsense02. Unpick Automatically generate a shared TLS authentication key and leave Enable authentication of TLS packets. Use the same Tunnel Network as on the server, in my case 10.0.8.0/24. 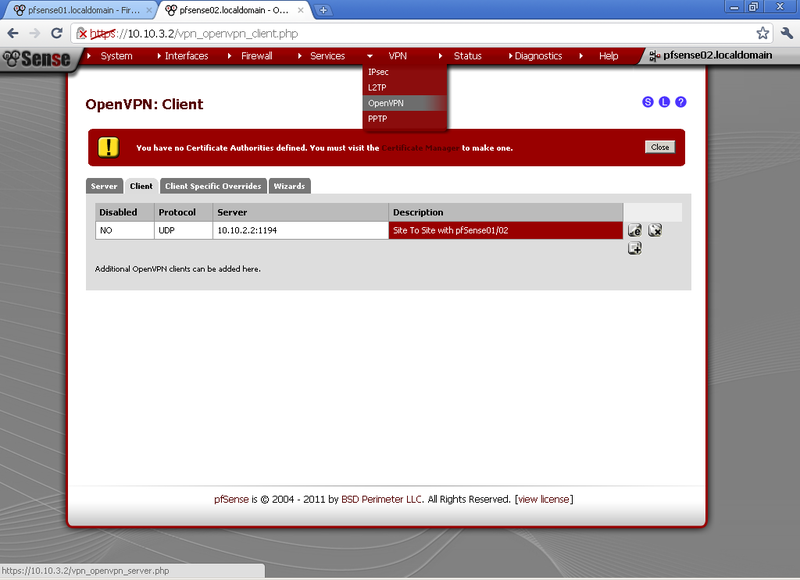 Enter Remote Network, this is the network behind pfsense01, for this case 10.10.9.0/24. 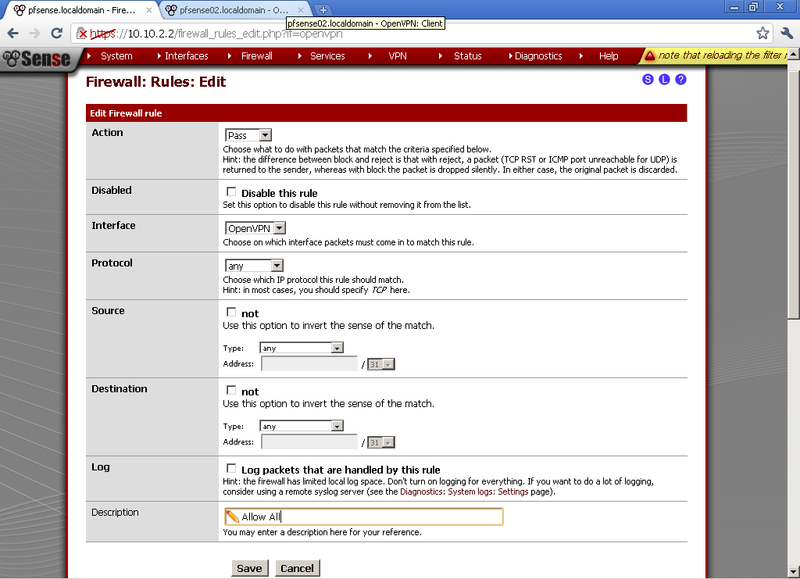 Add Allow All rule in Firewall > Rules on the OpenVPN leaf. Now go to Status > OpenVPN and you should see that the connection is established. From the Server prospective, again on Status > OpenVPN. Now you should be able to access hosts from the other network successfully. Sooner or later you will have two or more geographically distant LAN that you want to connect together. Whether we are speaking about to branch offices or home and office, or simply your office LAN and some co located servers in a data center, it is only a matter of time before you need such solution. In this case we will use two pfSense 2.0 RC1, one in each remote location. The map shows our lab setup for the purpose. In this post we will use Shared Key as a way to authenticate the two routers. On pfSense01, this machine will play the role of server in this scenario. Protocol, Device Mode, Interface, Local port – you can leaf the default for now. Description – Enter whatever is informative for you. Choose different from both of your LAN subnets for Tunnel Network, in our case 10.0.8.0/24. Local Network – The LAN behind the pfSense01, in this example 10.10.9.0/24. 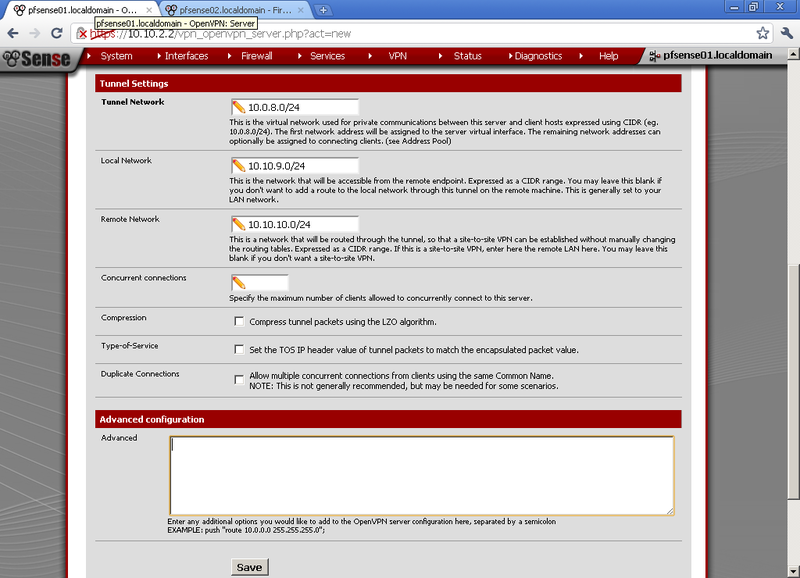 Remote Network – this is the LAN behind the pfSense02, as on the diagram 10.10.10.0/24. Click on Save button and we are Done. Open the newly configured server and copy the Shared Key. We will need it for the setup of pfSense02. The Action is Pass, Select WAN as Interface, UDP as Protocol. For Destination port range, select OpenVPN in our case it is 1194, if you have used some other port in the configuration enter it here. Enter some description also. Go to the OpenVPN leaf. Here I have made a very basic Allow All rule. If you have some security concerns, or want to limit the communication between the two sites, make one or more rules to fit your need. pfSense02 will play the role of client. Protocol, match the one from the server in our case UDP, Device mode – tun, Interface is WAN, Local port, leave empty for random, or enter manually one if you want. 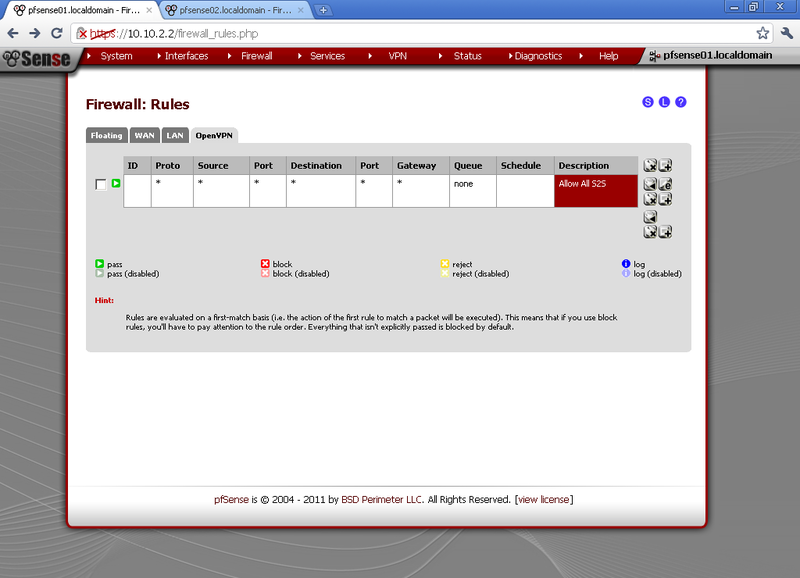 Server host or address, enter the WAN IP address on the first router pfSense01, in our case 10.10.2.2. Server port, whatever port you have used on the server, in our case the default 1194. Enter Description. For Shared Key, paste the one from the pfSense01 here. Encryption algorithm, duplicate the one from the first configuration, in our case BF-CBC (128-bit). Tunnel Network, duplicate the one from the server. 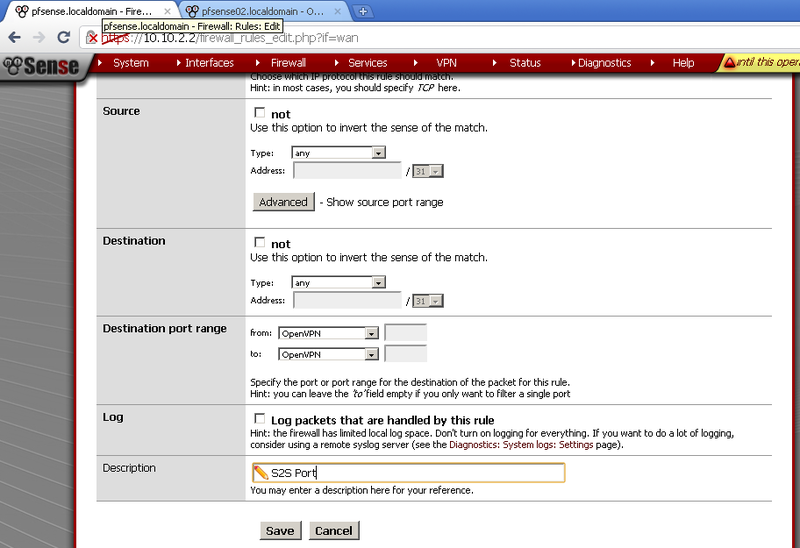 Remote Network is the LAN network behind the pfSense01, for our example 10.10.9.0/24. Leave the rest to default, and Save the configuration. 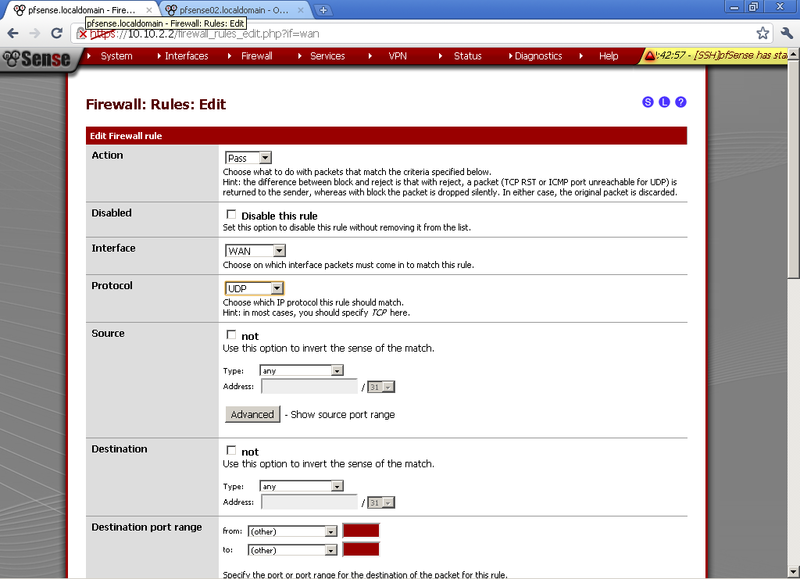 Again add a rule on the OpenVPN leaf in the Firewall > Rules section to allow traffic flow between the two sites. Here again I’ve setup a rule that Allow All traffic between the two sites. Now go to Status > OpenVPN. You should see that Status equals UP. Now you should be able to successfully communicate with hosts from the other network.